Exterity Digital Signage solutions enable network-wide delivery of relevant, informative, persuasive and visually engaging multi-media digital content to your video monitors provisioned through Exterity AvediaPlayer Receivers. Epiphan’s broadcasters and recorders work with the Exterity AvediaPlayer Receivers by providing an encoded stream of your video and audio content for redistribution to your video output monitors. Capture video content, encode with an Epiphan device, and stream to an Exterity AvediaPlayer Receiver to display on network-wide video monitors! The steps are very similar regardless of whether you’re using an Epiphan professional video streaming device or another Epiphan broadcaster or recorder. The procedure below identifies the products as “Pro” when indicating steps to take with Epiphan professional level devices, and “Other” for other Epiphan broadcasters or recorders. Before getting started with the streaming event, make sure your content is configured correctly with the Epiphan device. The best way to do this is to preview the stream. Connect to the admin interface of your Epiphan Device using your preferred connection mechanism. See the user manual for options. Click Info from the Configuration menu; the device information page opens. Click View for the channel you want to stream; the preview starts. 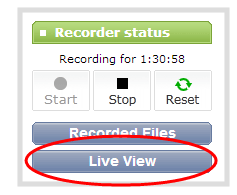 Click the Live View button at the left of the screen; the preview starts. Make any needed adjustments. Refer to the user manual for help. Power up your Exterity AvediaPlayer and connect it to your monitor and network. If you have any questions, refer to the Getting Started Guide. 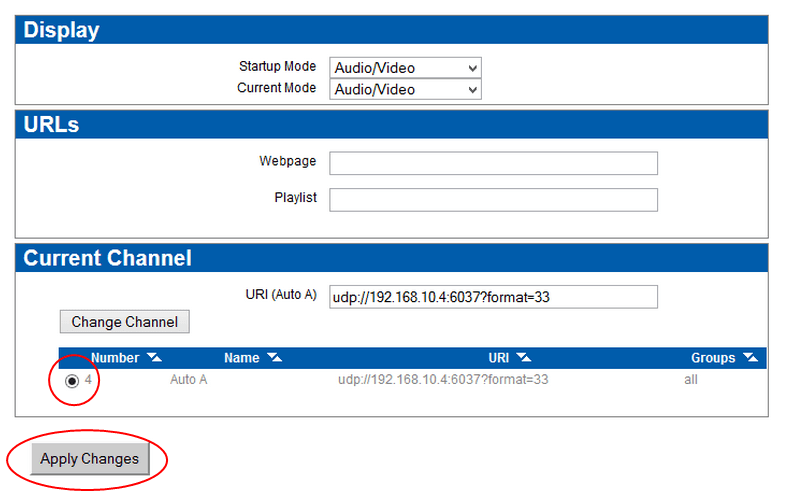 Out of the box, Exterity Avedia Player is set up to obtain an IP address automatically using DHCP. Navigate to the Display menu and make note of the four digits directly following the colon from the IP address displayed under the Current Channel heading (these four digits will be required in the next step). Return to the Epiphan Systems’ web UI. Click the selected channel’s Streaming link. Select the Publish dropdown menu in the Publish to a Server section of the page. Select Using MPEG-TS UDP push as your publishing method. Destination IP will be the same as the IP address of your AvediaPlayer. In the Destination Port field, enter the four digits you recorded from the previous step. Enable SAP announcement by checking the checkbox. 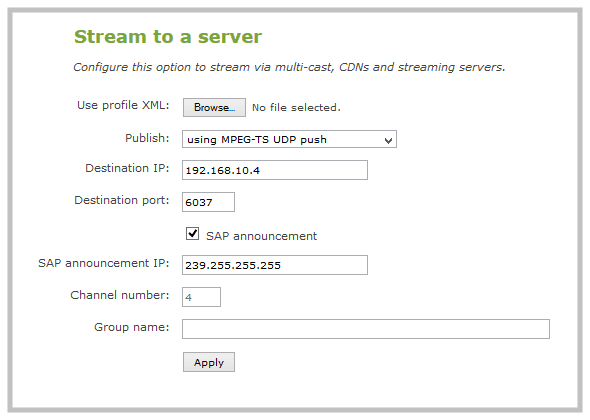 Enter 239.255.255.255 in the SAP announcement IP field (this is the default SAP announcement IP address). Give your Epiphan device a few seconds to establish streaming. Return to your AvediaPlayer’s web admin interface and navigate to the Display menu. The stream from your Epiphan device should appear. Select this stream and click Apply Changes. And that’s it! After a few seconds your stream should appear on the monitor.